Yellowstone is THE first and arguably the finest national park. From animal adventures, geyser gazing, and hot spring hopping, Yellowstone’s got quite diverse offerings. And it’s a behemoth at 2.2 million acres. What that means is dedicating plenty of days to touring and making the most of your vacation by doing some pre-planning. Here are some of our tried and true tips for making the most of a Yellowstone National Park experience from accommodations to dining to what to do and what not to miss. When I think back to our Yellowstone vacation, it makes me smile from ear to ear. Clearly, I’m not alone: Yellowstone National Park’s stats through September 2018 are a staggering 3.8 million visitors. As always, peak season falls during June, July, and August. And the most interesting statistic is that September’s attendance in 2018 was up 13% to 724,000-ish visitors. What do these numbers mean? It is PIVOTAL to pre-plan as much as possible for trekking to this behemoth park. After traveling to this national park in July with my family, I learned a few tips worthy of knowing before you go. And I’m happy to share because every second counts in Yellowstone. Lodging and tours will fill up fast, especially for the busy summer months. I’m talking a YEAR or more in advance! For example, I searched dates for summer 2019 already and Old Faithful Inn is filling up. The rule of thumb: the more particular about where you want to stay, then the farther out you need to plan. Staying at one of the nine lodges or the campgrounds in the park will save TONS of time because Yellowstone is massive! It can take upwards of 1-2 hours to get from hotels outside the main gates to the points of interest. And some of the best times to enjoy the park are mornings and evenings when others have left for the day for their off-park accommodations. Exciting news: the new Canyon Lodge and Cabins will be available beginning of June through early October. 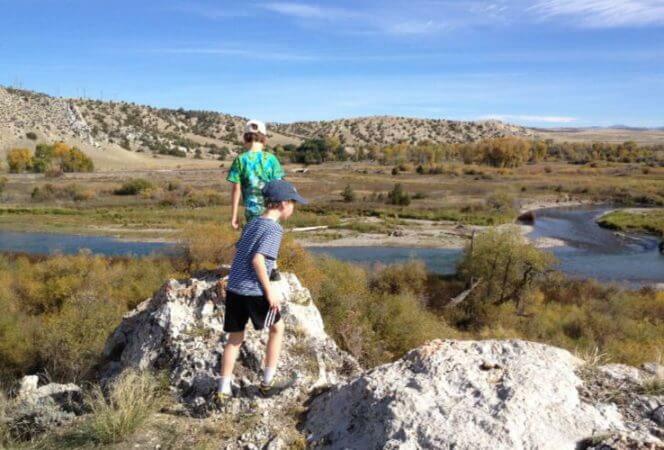 Located on the east side of the park near the Grand Canyon of the Yellowstone River, Canyon is in a prime location. And all 5 of Canyon’s new lodges are LEED certified sustainable lodges, and it has been named one of the New York Times’ 5 Hotels for Eco-Conscious Travelers. So that means these will fill up fast! Several new lodges are being added to Canyon Lodge and Cabins opening in summer 2019, and they will be the newest accommodations in Yellowstone. Photo credit: Yellowstone Park Lodges. My other top choices for staying are Lake Yellowstone Hotel, Old Faithful Inn, and Old Faithful Snow Lodge. I made 2 separate hotel reservations within a month of our July vacation at Yellowstone Park hotels. You read that right. Granted, we had to be more flexible about our accommodations, but it paid off for us. We stayed one night in a cabin at Lake Yellowstone and the second night at the Old Faithful Snow Lodge. And believe me, I was thrilled! Buyer beware: Like ALL Yellowstone park lodging, the Old Faithful Snow Lodge and Old Faithful Inn do not have AIR CONDITIONING. Sure, they had a fan, but for a person like me who loves sleeping cold and piling on the covers, this was WAY too much money to pay for a warm night’s sleep. Then again, I loved rolling out of bed the next morning to watch Old Faithful with a handful of people, as opposed to the hordes who were there the previous day. The cabins at Lake Yellowstone are quaint, cozy, and in an excellent location. For those looking for fancier digs, book a room in the Lake Yellowstone Hotel. Another advantage to staying on property is scoring dinner reservations, which are required for Old Faithful Inn, Lake Yellowstone Hotel, and Grant Village dining rooms. Note that priority for dinner reservations is given to hotel guests. Visitors not staying at the Old Faithful Inn, Lake Yellowstone Hotel and Grant Village must wait until 60 days in advance to make a dining reservation. One of our favorite meals of the entire trip was at Old Faithful Inn, so it’s well worth snagging that reservation. Here’s our advice: make dining reservations at the Old Faithful Inn Dining Room and enjoy a cocktail before dinner at the observation area on the Inn’s second floor. The Dining Room has a varied, inventive menu featuring local game, steak, chicken and seafood. We enjoyed the Inn and geyser at sunset with way fewer guests and walked back to our hotel room at the Old Faithful Snow Lodge. Gourmet Macaroni and Cheese with Elk Jalapeno Cheddar Bratwurst was a big hit at Old Faithful Inn Dining Room. I’d also love to try the Roosevelt Old West Dinner Cookout. It has two options for getting to the cookout site via either a horse or in a covered wagon. What awaits is steaks cooked to order, Roosevelt Baked Beans, potato salad, coleslaw, cornbread muffins, chuck wagon corn, watermelon, and fruit crisp. Not to mention piping hot coffee over a roaring campfire while a cowboy sings some Western tunes. (Vegetarian meals can be accommodated with advance notice.) For reservations for tours and dining, fill out the Online Activities Reservation Form. Get the lay of the land with an overview tour. Extra benefit: someone else drives you around this massive park. As one of the drivers, I can say it’s nice to be able to be chauffeured and take photos while being driven to all the scenic spots. As for booking tours, don’t rely solely on the website because it only takes a request form. Instead, call central reservations at (307) 344-7311. Once I was familiar with which tours I was most interested in, I would call to see if anyone had cancelled. Surprisingly, this was a great approach as we scored a Circle of Fire tour just weeks before our July visit. This signature Yellowstone tour has been offered longer than any other and focuses on Old Faithful Geyser, Yellowstone Lake, Hayden Valley (with stops for wildlife as available), the Upper and Lower Falls of the Grand Canyon, and the Fountain Paint Pot Nature Trail. One of our favorite spots on the Circle of Fire bus tour was the Fountain Paint Pots, which earned this moniker by the colors produced because of the mud’s high acidity levels. 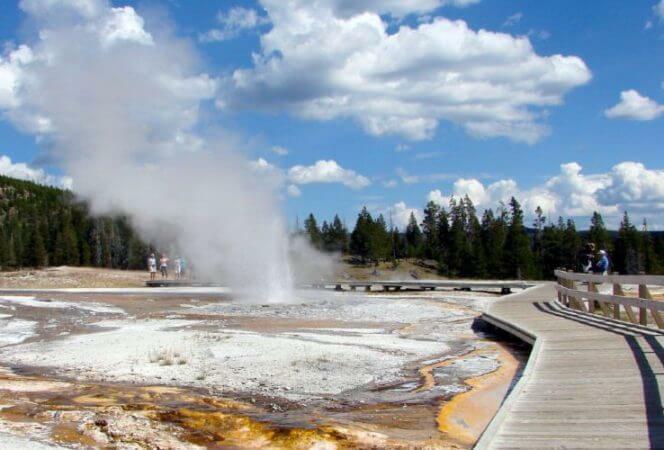 All four types of Yellowstone’s thermal features may be seen here: fumaroles, hot springs, geysers, and mudpots. The Leather Pool at the Fountain Paint Pots Nature Trail is one of the thermal features on display at Yellowstone National Park. All the Historic Yellow Bus tours were already booked, but the Yellowstone Bus was just fine with us. The only issue we had was a couple was 10 minutes late back to our bus at the very first stop. We all sat patiently until they returned but, needless to say, it didn’t happen the rest of the day after that! Custom guided tours are also available: van tour starting at $833 for 8 hours and accommodating up to 11 people and mini-bus for $ 291 for up to 14 people. Since we planned on already having an overnight at Old Faithful, in hindsight I should have chosen a tour that focused more on the upper part of Yellowstone. But having a tour guide who can get real time information on animals and what’s happening in the parks is very useful. One other touring company that I would highly recommend is BrushBuck Tours. While we didn’t get to experience their Yellowstone tour, we did try them in Grand Teton National Park and then wished we had while at Yellowstone, too! Touring Yellowstone can be exhausting, so pace yourself. We only had two days, so we attempted to cram in as much as possible. This is by no means a restful vacation, but we wanted to see as much as possible and we were willing to push ourselves. Bonus: it meant we slept soundly as soon as our heads hit the pillow! A great starting point is the National Park Service’s Yellowstone site. Turn your phone into a tour guide by downloading the Yellowstone app from the app store for the up-to-date information about visitor centers, places to stay and eat, and shopping and services throughout the park. It’s a great resource for the latest geyser predictions, campsite and lodging availabilities, and road conditions from Yellowstone’s live data feeds. Yellowstone is massive: look at how much ground there is to cover! So be strategic about it and plan what spots you want to see most. Also be open to add in a few after talking to the rangers-they know all the good intel about this national park. Packing a cooler filled with groceries was an absolute lifesaver for us. We loaded up with drinks, snacks, and sandwich fixings and made our lunches. Then we splurged at the resorts for dinner both nights (Lake Hotel Dining Room and Old Faithful Inn Dining Room). Filling the cooler up nightly with ice from the ice machines kept everything cold. And although there are gas stations within the park, it’s wise to go ahead and fill up before entering. Wildlife WILL cause traffic delays, and nobody wants to run out of gas in a national park. Weather in Yellowstone in summer is quite varied. Summer can be a real scorcher, but the evenings get chilly. Check the forecast and make sure you pack accordingly. Must-haves would be binoculars, camera/lenses, sunscreen, bug spray and, if planning on hiking, bear spray. Lamar Valley and Hayden Valley always come to mind when people ask me where we saw the most animals. And we weren’t alone: Everyone we met who had see some variety of wildlife had done it in one of these two valleys. Bison are plentiful, even up close to the road! We also spotted elk, wolves, and brown bears. It’s thrilling to encounter animals while touring! My suggestion: Book a Historic Yellow Bus guided tour that will tap into all the hotspots for wildlife watching. For early birds, there’s the Wake Up to Wildlife Tour. Another optimum tour for wildlife watching is the Evening Wildlife Encounters. The key takeaway here is to capitalize on the early mornings and/or early evenings in Yellowstone. Lamar Valley is loaded with bison! Most our animal sightings were in either Lamar Valley or Hayden Valley. Two words for the Grand Canyon of Yellowstone National Park: worth it! It’s actually three incredible waterfalls called Upper Falls, Lower Falls, and Crystal Falls where the Yellowstone River encounters the canyon and gorge. The Yellowstone River becomes a waterfall as it plunges 308 feet over the Lower Falls. Get your steps in on the trail to the Lower Falls. It’s quite steep (328 steps down) and loaded with switchbacks, which means as challenging as it is to descend, it’s that much harder to walk back up! But this spot is awe-inspiring as visitors are fingertips aways from the waterfall as it roars past. A fabulous photo opportunity. If this sounds too strenuous or too much like work, go to Artist Point where no climbing is required. 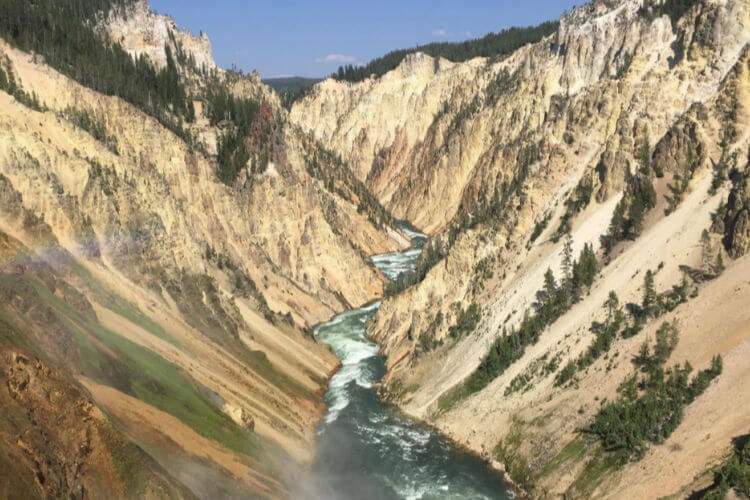 The Grand Canyon of Yellowstone is not be be missed; either make the 3/4 mile trek down to the Lower Falls vantage point or view from the more easily accessible Artist Point. Also a MUST SEE is the colorful and jaw-dropping Grand Prismatic Spring at the Midway Geyser Basin. It’s larger than a football field and deeper than a 10-story building! What captivates is its gorgeous colors. Alongside Grand Prismatic, you’ll find Excelsior Geyser, Turquoise Pool, and Opal Pool. Grand Prismatic Spring is the perfect name for this beauty. The Old Faithful Visitor Education Center includes the Young Scientist exhibit room with hands-on exhibits of the science behind the geysers. Try to experience Old Faithful early or late in the day to avoid heavy crowds, and check immediately about eruption times on posted placards. Snag a spot early to watch as the geyser shoots water on average 145 feet in the air for 1 1/2 to 5 minutes. Lots of vehicles and people usually means a great opportunity for wildlife watching. This happened in Hayden Valley when we spied a full parking area and people set up with scopes and fancy lenses. Good thing we joined them – they were tracking several wolves! Not far from that spot, we saw cars double parked on the side of the road. Lo and behold, a brown bear was in the clearing and drawing all the attention. We didn’t have to leave our truck to have a close encounter with a bison. And when I say close, I mean it walked up the center of the road, then turned and passed us on our right side. Senior Pass: Available for: U.S. citizens or permanent residents age 62 or over. Applicants must provide documentation of age and residency or citizenship. Cost: $80 for a lifetime Senior Pass and $20 for Annual Senior Pass. Every Kid in a Park (4th Graders): And don’t forget if you have a 4th grader, the entire family gets free admission to all national parks as part of the Every Kid in a Parkinitiative. 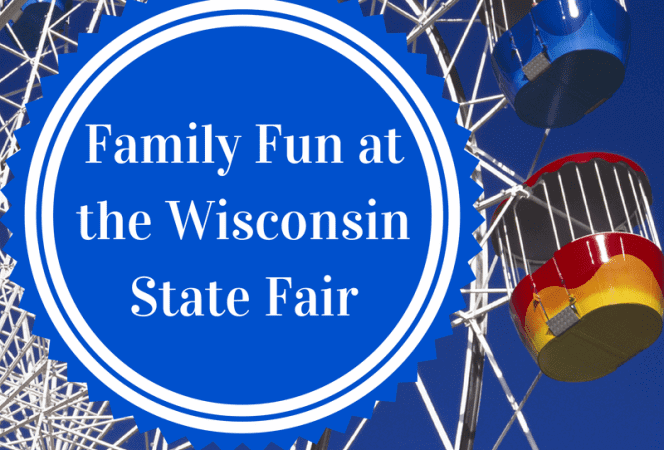 *This article originally appeared on Travel Plans in Moms Hands by Sherry Boswell.